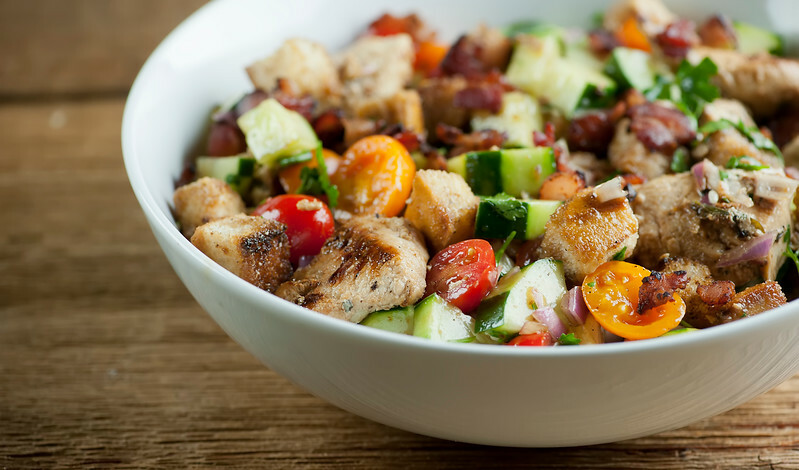 This recipe for chicken and bacon panzanella salad is a hearty bowl full of all the good things! Try this bread-based salad for a great healthy supper. I do love a good panzanella salad, and this chicken and bacon panzanella salad is definitely no exception. Panzanella salad is a salad made with chunks of bread and tomato, and it is definitely glorious in the summertime when the tomatoes are at their peak. (I miss you, summer tomatoes!) But it is also the very best kind of salad to have in the chilly months, when you want some salad but you also want something warm and substantial to get you through the last blast of winter. This version adds chicken and cucumber and onion and BACON to the equation, and is just the ticket to panzanella happiness. Let’s make it! It was especially necessary this past week, as we were smack in the middle of that blizzard that came to visit the East Coast. 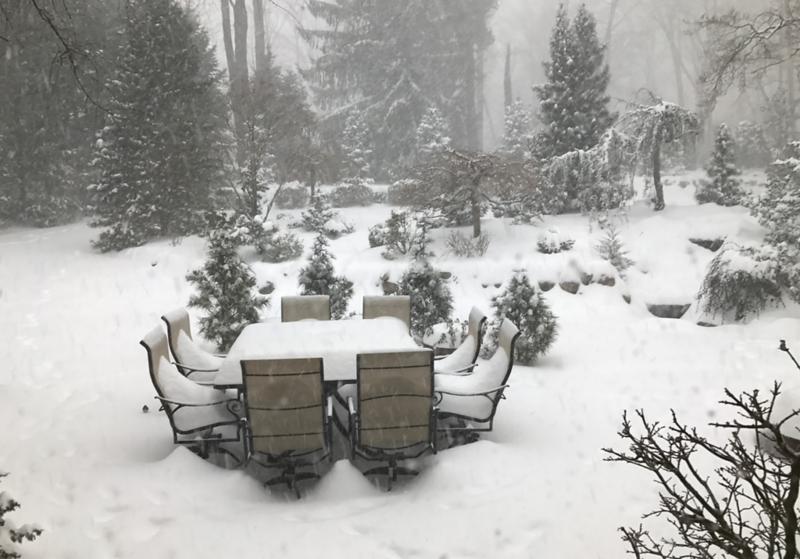 Yep, literally right after we had finished clearing up all the winter sticks and leaves in our yard and gotten ourselves ready for those first spring buds, THIS happened. Makes you want to run right outside and pull up a chair at our patio table and breathe in that nice spring air, right? HA. 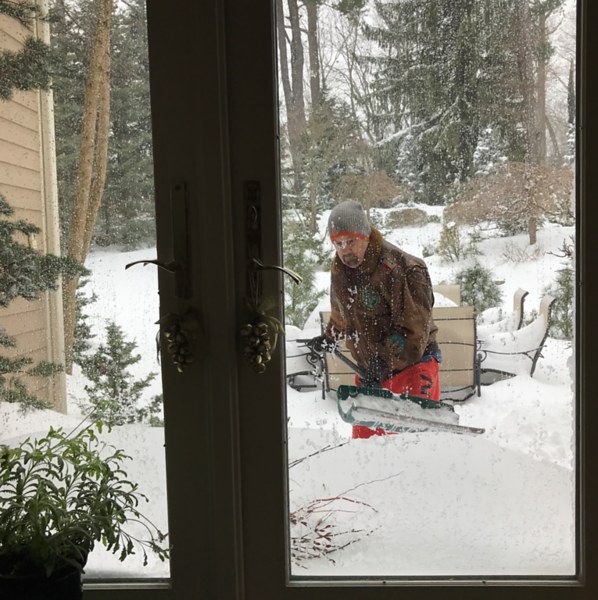 Some members of the family put on their gloves and their Clemson hat and went outside to attack the 14 inches of snow that piled up that day. 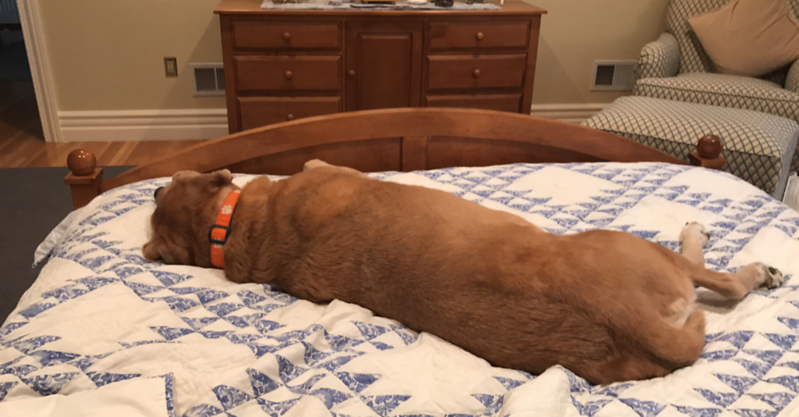 Others wore their lucky Clemson collar and lounged around illegally on the bed. By the end of the day, everyone was giving thanks that the power had held up during the storm, and we were ready for a nice hearty bowl of panzanella goodness. If you have a leftover hunk of Italian or French bread, that (along with a blizzard) is an excellent reason to make panzanella. Cut it up into nice little cubes, crust and all please. Now cut some boneless chicken and some bacon into bite sized pieces as well. Ditto for some cucumber, some red onion and some cherry tomatoes (which magically hold on to their tomato taste all year long). I promise all this chopping is going to be worth it. Meanwhile back at the salad, you can also use bottled vinaigrette and that will work just fine. 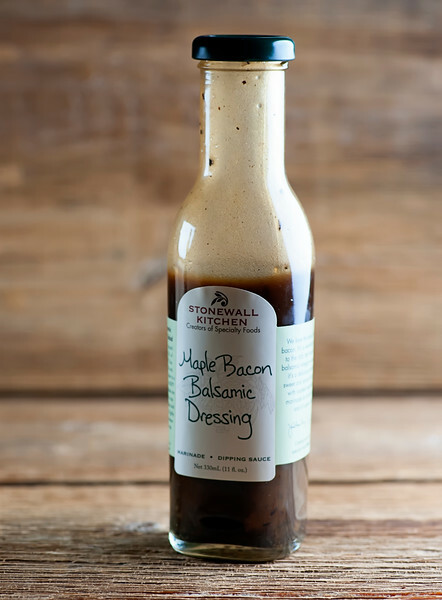 Here is my all time favorite dressing, from the always fabulous Stonewall Kitchen. I mean, maple and bacon. Obviously. Yum. Now you want to do what I always beg you to do with salads, which is drizzle on a little dressing and taste. Drizzle and taste. Drizzle and taste, until there is the perfect amount of dressing. You can always add more dressing, but you can never take it away. This is a reality. Now put a pitcher full of tulips on the table, dish out the salad and Think Spring. It WILL come. Cook the bacon in a heavy deep skillet until it is done to your liking. Scoop it out, leaving the drippings in the pan, and drain on paper towels. Add the bread cubes to the skillet along with a pinch each of salt and pepper and cook in the drippings over medium high heat until toasted. Scoop out and set aside. Add the chicken to the pan and stir until cooked through, about 10 minutes. Put bacon, bread cubes, chicken cherry tomatoes, cucumber, onion and parsley in a large bowl. Drizzle with a little dressing, taste and repeat until the salad has just enough dressing for your liking. Add a little more salt and pepper if needed and serve! I love a good panzanella salad Kate! Absolutely love the bacon and chicken in this one! You’re making me think summer because that’s when I usually make a panzanella salad! Oh, wow. This sounds so perfect for the warmer weather that we’re finally getting! I need some of that Maple Bacon dressing in my life! You DO! Stonewall Farms is the best. I haven’t had panzanella salad in so long and it’s the perfect time as I have a hunk of bread in the pantry! The chicken and bacon addition is perfect! I could totally go for a big bowl of this right now :) Pinned! P.S. It’s still snowing here too. Will spring get here already? Oh no to the snow! We actually have crocuses braving blooming amid the snow patches here. Thanks for the pin! This was delicious, and makes a very hearty meal without being heavy. Thanks Suzanne! We love it in our house, especially after three snowstorms in a row!